There has long been a philosophical divide between urban and rural dwellers. The conservative-minded "king of the castle" suburban dwellers vs. the more idealistic liberal minded urban dweller. There are always going to be exceptions to the rule, but this generalization will stand up to scrutiny. There's always those who feel that they are being asked to contribute more than everyone else. This recently enacted additional charge on every water bill in the City of Windsor is a gross abuse. This practice applies a financial burden upon all its water users, not just upon those who actually require the upgrading of water delivery lines due to age, damage or impaired operation. Some (in fact many) citizens reside in homes built within the past 25, 15, 10 or five years upon which hefty development charges were levied before their respective dwellings were constructed and occupied. To now apply additional levies each month constitutes double taxation. These citizens are being assessed on the water bill as if they lived in homes that now need new waterlines. This is not the case. If the city needs to replace watermains, as I suspect it must, the appropriate mechanism would be a local improvement charges bylaw under Ontario Regulation 586/06 and the Municipal Act 2001. When a watermain or mains and feeders require maintenance or replacement, it would be appropriate that the charges for such works be raised from those in the areas concerned who have enjoyed the benefit of delivery through those mains being replaced for periods (according to public works) of 60, 80, 100 or more years. These costs should not be collected from others who have received no advantage or service from those pipes nor will enjoy the benefit in the future. Such costs are rightly collected from those who will profit from the improvement. Mr. McLeod should be careful what he wishes for. The subsidization that urban sprawl receives is well documented. The late Jane Jacobs, Toronto's pre-eminent urban theorist, warns "Suburban sprawl is far more costly than anyone imagines". That new raised ranch out in the suburbs might not seem to be a bargain if the hidden costs incurred by a few people -- but paid by everyone-- were added to the price. "Beware, there are always side effects," said Ms. Jacobs, whose new book, The Nature of Economies, is making analysts rethink how important human potential is in economic growth. All taxpayers are subsidizing sprawl to the collective tune of at least half-a-billion dollars a year, concluded the Greater Toronto Area Task Force headed by consultant Pamela Blais. The further utilities are extended and the busier the highways, the more expensive they are to build and maintain. But these costs are shared by everyone through utility rates and taxes. More difficult to tally are the costs of air pollution, deterioration of the environment and traffic chaos. Ms. Blais estimated the suburban sprawl is adding as much as $1-billion each year to the costs that have to be covered by taxpayers for health care and law enforcement. Leslie Parrish, of Corporation For Enterprise Development writes that when development occurs on the outer fringes of town, the local government must re-create a system of roads, schools, and public safety services, while having to continue to support an underutilized set of older ones in the center section of town. Development that occurs in these outlying areas has far higher marginal costs than infill and renovation in developed areas. This cost rises even higher when new developments are low density. 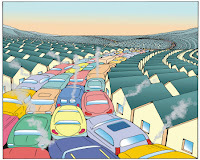 Since in low density developments residents are spread out on larger lots, the same amount of sewer line, roads, and other services are used by fewer people, reducing economies of scale. Utility companies also subsidize sprawling, low density development. Telephone, cable, and electric companies often charge customers on an average cost basis, with the same rate collected for all customers no matter where they live within the metropolitan area. Compared to a customer in the downtown area, a household in a fringe suburb costs 10 times as much to serve. Therefore, residents living closer in subsidize those living farther away. Though many local officials encourage new growth, citing its economic development potential, the services these communities must provide often outweighs the benefits they receive. Commercial and industrial uses do tend to pay for themselves, however, these developments usually spur more residential development, which make their benefit questionable from the sprawl perspective as well. A majority of federal transportation spending has traditionally always gone to highway funding. These new highways open up additional development potential on newly accessible, undeveloped land. Driving is also heavily subsidized. Despite recent complaints of rising fuel costs, these prices are much lower than they would otherwise be if the full environmental and health impacts were taken into account. Data gleaned from Canada's 2003 census helps to shine a spotlight on the current imbalance between urban infrastructure spending and the expense of supporting suburban development. For every dollar that suburban dwellers received in municipal infrastructure upgrades/installations and services, they only paid 86 cents. That leaves the cities established neighbourhoods - those who have been paying for their infrastructure for decades - to pick up the tab. This includes fire, ambulance and police services, as well as all the hard infrastructure that is provided to these fringe developments. Writers such as Mr. McLeod have no problem being on the receiving end of municipal largess, yet when it is their turn to contribute to the pot (that they have done their fair share in emtying) they scream foul. I suspect there would be a huge problem with a user-pay system if it was fairly implemented across the board. Then, those $200,000 raised ranches out in the farm fields would easily begin to approach $750,000+. I doubt we would have a problem with urban sprawl then. Posted by Chris Holt at 5:16 p.m.
June 26, 2007 at 10:47 a.m.
Two problems in Windsor. The money raised by the Sewer Surcharge and Watermain Replacement levy should actually be spent on those things. That's currently not the case. For example, Council recently pulled a million out of Enwin to facilitate a rate reduction for multi-residential owners. While I'm sure multi-res owners and their tenants are happy, this is not what the money was intended for. The current system of water rates/sewer surcharges are used to disguise tax increases. Your post also highlights why a more aggressive approach to brownfield redevelopment would benefit all in the long run. June 26, 2007 at 6:15 p.m.
That's the frustrating aspect of politics - and one of the reasons I've taken a step back from that arena. You hear that council has made a decision that fits in the grand scheme of things (whatever that may be), yet you know you are going to have to constantly dog them to make sure they follow through with the intent of that decision. I'm glad we have watchdogs out there who have the time and patience to keep on top of them. Yes - brownfield development, adaptive reuse, infill and renovation are all community-strengthening techniques that fully utilizes our existing infrastructure. Definitely the way to go. June 27, 2007 at 7:44 p.m.